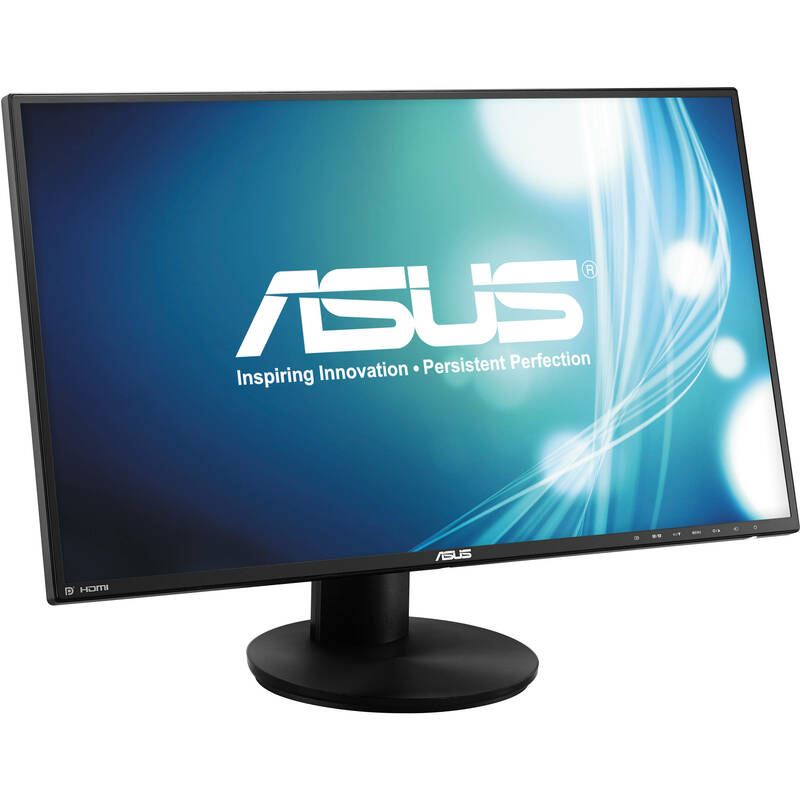 The ASVN279QL 27" 16:9 LCD Monitor from ASUS is a mercury-free LED-backlit panel with a narrow bezel of just 0.3" / 0.8cm and maximum brightness of 300 cd/m2. It has a 178˚ (H) / 178˚ (V) ultra-wide viewing angle AMVA+ panel that eliminates color shift on the screen. The monitor is also VESA wall mount compatible, and has the capabilities to be part of a multi-screen solution. It features Full HD 1080p (1920 x 1080) resolution and supports enhanced connectivity, which includes DisplayPort, HDMI/MHL, and VGA inputs. Unlike the VN279Q, this model features a more ergonomic stand for your viewing comfort. Box Dimensions (LxWxH) 27.8 x 17.7 x 7.6"
ASVN279QL 27" 16:9 LCD Monitor is rated 4.6 out of 5 by 14. Rated 4 out of 5 by Anonymous from Nice monitor for the money I was looking for an upgrade to my old 22 Samsung monitor on my home computer (general use, email, browsing). Was also looking for built in speakers to avoid the extra clutter. Set up was easy (plug and play), but access to the menu and making adjustments are not all that user friendly. With an HDMI connection I was able to lose the dedicated audio cord. The picture is decent. Had to tone down the settings (brightness and contrast) to get a good image. Colors are great, but text and some images while browsing are not real sharp. You will have to play with the settings to get something you are satisfied with. Built in speakers are fair, even for simply listening to audio in instructional video and online courses, but they serve my purposes. Fine for general use, but I think you would have to spend a bit more to get a solid image in a monitor this size. Rated 5 out of 5 by Len from One Great Monitor For The Price Replaced my old 30 apple with this monitor. I was using dual displays for graphic design. This monitor blows away the apple as far as resolution is concerned and the ability to convert to portrait mode more than compensates for the slightly smaller size. I found the menu for adjustment kind of challenging initially but once I got the hang of it, I was able to calibrate and the results are great. Rated 4 out of 5 by csmithfdub from Impressive for the price I use this monitor as an extension to my laptop. I needed something that didn't have that washed out, filmed over, look to it. This display has impressed me for the price. Set up was easy, 5 minutes tops. It is large, and crisp. I would recommend to a friends vs spending $+ depending on your needs. Rated 5 out of 5 by vegetable soup sunday with cornbread from a vision come true i always thought there was wasted space on the margins of a website with a horizontal monitor. what about turning it 90 degrees? this monitor makes it so easy with it's base and put in portrait mode, you have a full page, less scrolling, and images are breathtaking. the clarity is profound. Rated 5 out of 5 by Sandra from Good value Bought this to replace a Samsung monitor - needed a bigger screen for my aging eyes and the ability to adjust the height and tilt since my husband and I share the monitor. So far so good - good color and resolution. My eye strain has greatly improved. Easy set up too. Rated 3 out of 5 by Roland from Works ok as backup I use this monitor as a backup. For me, it should cost only $149.00. It is very difficult and advanced to adjust the resolution. It can be done but it is frustrating. Asus should design a monitor the can be adjusted with an application on ones PC. Rated 5 out of 5 by Kangarandall from Great quality monitor Currently in studying computer science in college and this was a perfect monitor for coding. It has a great picture for movies and other media. It is working great and would recommend it! Does this monitor have a matte or glossy screen finish? This monitor has a matte screen.